November 15, 2018 -- Using 3D-printed models to plan and guide surgery for pediatric tumors enabled researchers from Spain to improve their understanding of complex anatomy and predict possible complications, according to a recent article published online in the European Journal of Pediatric Surgery Reports. The group, led by first author Dr. Ángela Sánchez-Sánchez from Clinical University Hospital Virgen de la Arrixaca, created 3D-printed tumor and organ models for four children with cancer who required an intricate surgical intervention. The 3D-printed models allowed clinicians to visualize and handle the tumor and surrounding organs and vasculature in 3D (Eur J Pediatr Surg Rep, October 18, 2018). "Preoperative tumor evaluation and surgical strategy planning are commonly based on conventional [2D] imaging techniques," the case report authors wrote. But 3D imaging "provides a better understanding of the spatial relationships between the tumor and adjacent organs and allows [for] exploring in an interactive form the surgical anatomy." Hoping to take advantage of the improved visualization provided by 3D-printed models, Sánchez-Sánchez and colleagues acquired either MRI or CT scans of the four patients, segmented and processed the scans using computer software, and then reconstructed the imaging data into 3D virtual models. Finally, they printed out the virtual models using a 3D printer (RoVa3D, ORD Solutions). They used these 3D-printed models to facilitate presurgical planning for the patients and actual surgery as well. Examining the 3D virtual models and the 3D-printed models afforded the clinicians distinct benefits in each case. The first case involved a 7-month-old infant with kidney cancer. Initial assessment on MRI displayed tumors on both the right and left kidneys. The left kidney tumor appeared to be so large as to require complete removal of the left kidney. 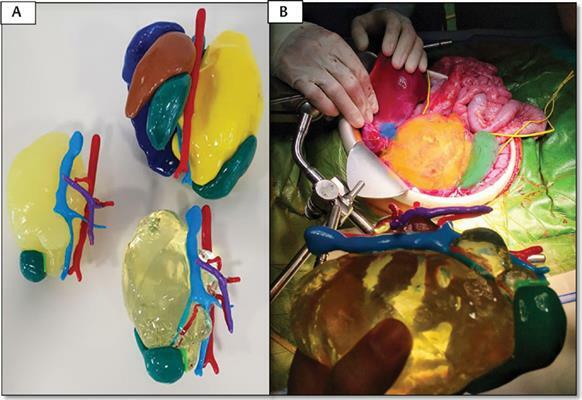 However, re-evaluation of the case on 3D-printed kidneys revealed that enough healthy tissue remained for surgeons to perform partial nephrectomy instead -- preserving considerably more kidney tissue than was initially thought possible. For the second case, the clinicians were able to determine the location of lung metastases on the 3D models much more precisely than they could on CT scans. In another case, physicians identified an abdominal neuroblastoma in a 13-month-old infant that they deemed unresectable upon examination on MRI. Yet 3D-printed models of this patient's tumor showed that it would be possible to resect the tumor safely, and the surgical team referred to the models several times to guide the operation. In the fourth and final case, the clinicians initially considered the neuroblastoma of a 5-year-old girl unresectable based on 2D imaging, but 3D-printed models again revealed that surgical intervention would indeed be possible. 3D-printed models of an abdominal neuroblastoma (yellow) with surrounding organs and vasculature: aorta (red), liver (dark blue), kidneys (green), spleen (brown). Image courtesy of Dr. Ángela Sánchez-Sánchez et al, "Three-Dimensional Printed Model and Virtual Reconstruction: An Extra Tool for Pediatric Solid Tumors Surgery," European Journal of Pediatric Surgery Reports (2018, Vol. 6:1, pp. e70-e76). Shared via Creative Commons license. When applied to these four pediatric tumor case, 3D printing offered a more precise visualization of patient anatomy compared with conventional imaging -- refining treatment options and facilitating surgery. "The application of both virtual reconstruction technology and the [3D] printing of physical models in pediatric oncological cases where complex tumor resection are required is a useful tool for improving outcome and will take a relevant place in the near future for planning and surgical training," the authors concluded.